7 digit LED, microcontroller, H:15 x W:23.5 x D:0.5” / H:38 x W:60 x D:1.3cm. This works is about Chernobyl deserter in Ukraine. I stayed and visited in Kramatorsk, Ukraine, to research on Chernobyl Catastrophe. I interviewed with local people, whose family members involved in the incident, and conducted interviews with them. In the work, there are two generations of Ukrainian men who involved with the catastrophe. In the front line are actual fire fighters who went to Chernobyl zone right after the explosion for helping the exploded nuclear plant in 1986. In the back are young Ukrainian guys who just went to Chernobyl exclusion zone illegally in the spring 2018 for curiosity and concern about the deserter happened in the past. 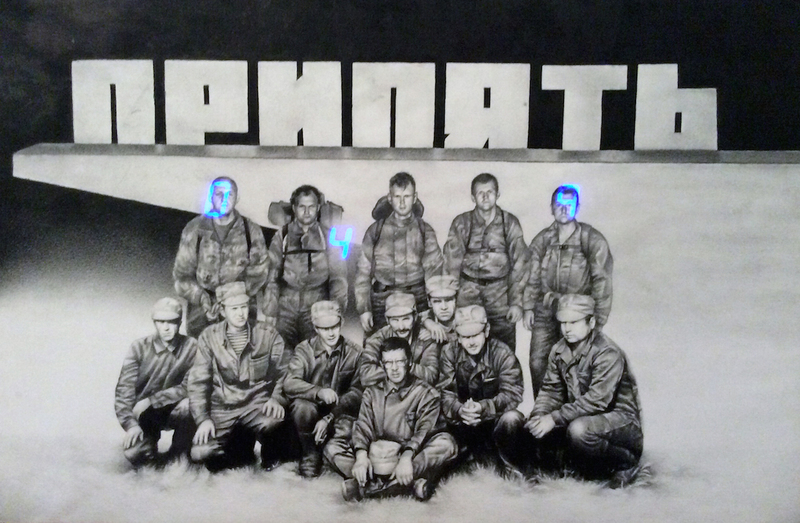 By mixing two generations in front of the evacuated old town Privet in Chernobyl zone – the actual fire fighters and modern youth in the same picture, I depicted the Ukrainian identity that have been grown through the deserter generations to generation. The numbers that appear on the work are a counter that counts from 0 to 999 that represents life expectancy, which is affected by the radiation from the catastrophe. It symbolize that the health and environmental effects are huge issue in the country.